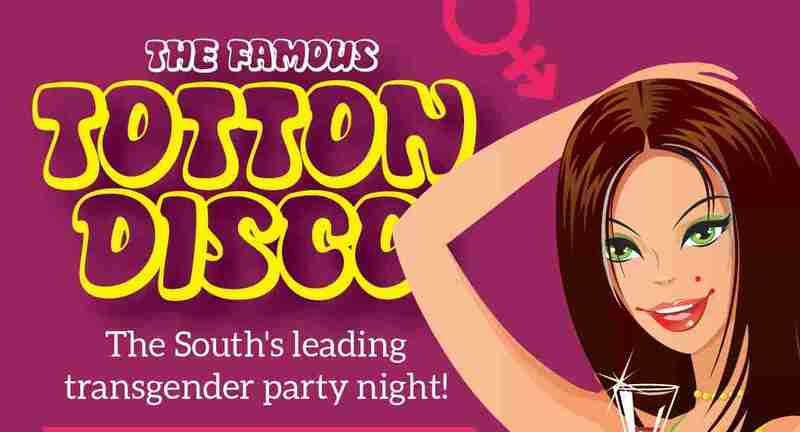 Welcome to the website of the Totton Disco, the Central-South's leading volunteer-run transgender disco venue (maybe the only one!). The disco has been running, in one guise or another, for more than twenty years in the same location: Totton's Empire Hall, on the western fringes of Southampton. 25-2-19: Ava Hay's "Wake" confirmed; the evening of 21-3-19. We've allocated a slot of about 20 minutes in the middle section of the disco, starting at 9:00 pm prompt. The optional dress theme that night will remain as it was planned: 60s & 70s. At the Empire Hall, Totton. Park in the nearby Library Car Park, not in the shoppers' car-park opposite. 11-2-19: Ava Hay’s “Wake”. We are still trying to select which of the forthcoming disco dates will best suit Ava’s immediate family (Ena and her sister Tracy). We know it won’t be Thurs 21st February. It is likely to be the following disco, on Thursday 21st March, but this still needs to be confirmed. We won’t have the usual notices but will have a 15 - 20 minute memorial. All income that evening, both entry money and raffle profits, will go to support Ena. It is with a great deal of sadness that I have to report Ava's death. She passed away just before 5 am this morning with Ena at her bedside. I'm in touch with Ena and will be visiting her later this morning to help her start the formal procedures. Eighteen months ago Ava asked me if I'd be the executor of her will. Sylvie Buckle is also involved. I'll post more information as it becomes available. Ava did not want a funeral. Instead we agreed that a forthcoming Totton Disco would be ideal as a memorial occasion. I will post news about that as soon as a decision has been made. I spent much of the day with Ena and will be returning to Bournemouth tomorrow with Sylvie to start the bulk of the executor’s administrative tasks. I wanted to post about opportunities for people to say their farewells and to scotch a few rumours. It was Ava’s wish not to have a funeral in any shape or form, just a very simple cremation, so it is not the case that “the family don’t want trans people there”. Instead, she wanted one of the forthcoming Totton Disco nights to be held in her memory; a wake, if you like. I’ve referred to this several times in recent months at the disco as an event where all the proceeds will go to Ena. We haven’t decided which one it will be yet. Sylvie and I will discuss it with Ena over the next couple of days, then start publicising it. Our final evening of 2018 was the Christmas party night; Thursday December 20th, with an attendance of 100 people. Our first night pf 2019 saw 64 people, a record for January. 2019 dates and themes on page 2 of this site. Many disco regulars are aware of Ava's serious health problems. She is currently in a Bournemouth care home. The long-term outlook is not good,. Please message or email me for further information. (Eleanor). We collected £240 at the Xmas disco to help Ena with day-to-day expenses such as bus and taxi fares. For February we'll be using the "main" door into the Empire Hall, rather than the side door that's been in use for the last decade. We've now had three noise complaints from a local resident during the past five months, and this is partly due to the side door being left open. The main door is further from the line of flats. We'll also be taking other measures to reduce the possibility of further complaints. Please bear with us. The end of 2017 and start of 2018 saw some record-breaking attendance figures for recent years. 89 attended our December disco, and 60 came in January. Obviously we're doing something right! People appreciate the welcoming atmosphere and the fact that the organisers are all volunteers., Of course Katie's great music sets are the real pull. If you are a regular at the disco and wish to volunteer for a half-hour spell, please have a word with Eleanor. From Autumn 2017 all the finances are on a solid footing, with a bank account that requires two signatories for all transactions. The current "finance" people are: Eleanor, Sylvie Buckle and Gina Hallett. We post a financial summary a few days after each disco; you can see it on our Facebook page. Numbers attending the monthly disco night have been steadily increasing during the past three years. We had a record-breaking 82 people attending our December 2016 Xmas party night. Our first evening in 2017, January's "SteamPunk" evening, saw a January high of 53 people. Our February evening continued in the same vein, with 54 attendees. With this in mind, we have decided to reduce the entry price to £5 for a six month period, and will review the effect in July. The Friends of Totton Disco is a loose-knit group of regular attendees. A small, informal committee of dedicated volunteers manages the monthly event, but is responsive to ideas from regular visitors. We encourage all attendees to participate in running the event, if they have the time. We are a mix of transgender people, friends, family and supporters. We welcome all genuine transgender people, wherever you are on the spectrum, along with partners and friends - as long as you are tolerant and would like a good evening out in safe surroundings, you will have a great time at our venue. It is important to understand that the organisers and the helpers are all volunteers from the local trans community, receiving no payment for what they do. We are not a commercial venue. What will you find when you arrive? A welcoming group of people (once we've extracted your £5 entry money! ); lighthearted chat and conversation; the area's best dance floor and the region's best T-girl DJ; a varied menu of hot food; a full range of drinks at the bar; a mixed clientele of TVs, TSs, wives, partners and friends; a safe and secure environment in which to relax and enjoy yourself; a complete absence of intimidation (which the organisers will not tolerate); links to local and national support groups and societies; expert help and advice if you need it. The venue is supported by the local police LAGLO. If you are a member, friend or supporter of the transgender community then please come along and support this friendly bunch of people. It will only cost you £5 to get in and you'll have an enjoyable evening. We go out of our way to make wives/partners/friends/family members feel welcome and part of the group. We do our best to run a safe and supportive venue, light-hearted but with people on hand who can point you in the right direction for further advice and help. The Empire Hall (next to Totton Conservative Club), Salisbury Road, Totton. SO40 3PY. It is best to park in the nearby library car park if you can't find a slot around the hall. There is a lit walkway from the library that takes you to the road very near to the Empire Hall. Do not park in the shoppers car park opposite or you may find yourself billed.